Don't you hate it when there's not enough streusel on top of your piece of coffeecake? or when all of the fruit or filling in the cake sinks to the too-soggy bottom? or the leftovers are too dry to enjoy on day two? Well, none of those concerns were a problem with this breakfast treat. 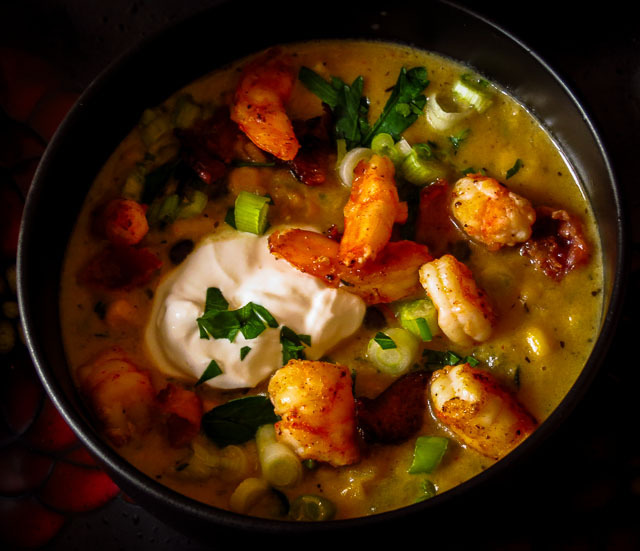 This recipe is a keeper! Once all of the ingredients were assembled the batter and streusel topping went together quickly. 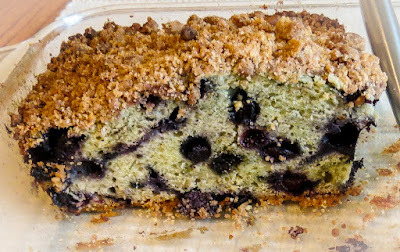 Frozen blueberries tossed with a few tablespoons of flour kept the fruit nicely distributed throughout the cake, avoiding the bottom-hugging issue. My oven must run a little cool so it took an additional 8 minutes to bake, but using a cake tester handled the baking timing question. Anticipation grew as a heavenly aroma filled the kitchen and wafted up the stairs as the cake baked. Tummy rumbles and the cook's impatience led to sampling before the cake cooled for the suggested 15 minutes. Oh - my - goodness, that was some good cake. Three of us enjoyed more than half that morning, and late-night snacks accounted for several more pieces. 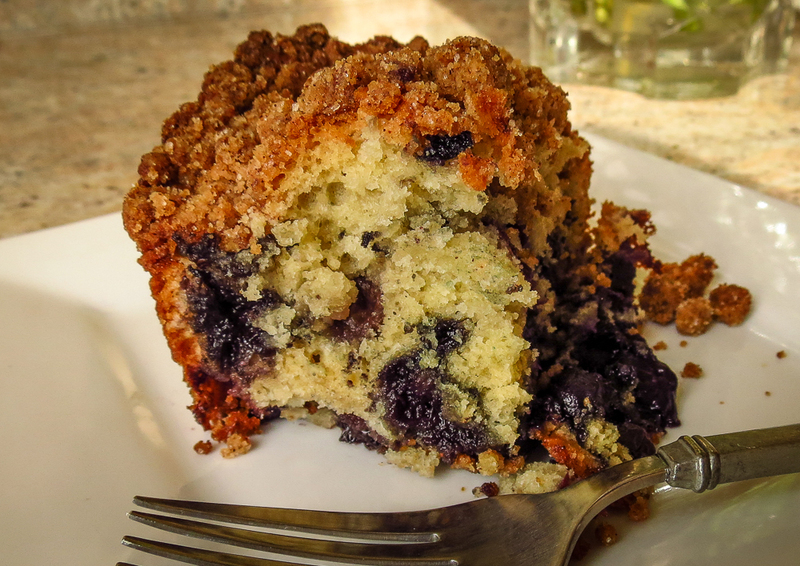 And yes, two squares did make it through the night for breakfast treats the next morning; still moist, still tasty, and prompting requests for more blueberry coffeecake with streusel topping, please. Place the dry streusel ingredients in the bowl of a food processor. Drop in the butter, and pulse until small crumbs form. (I used a pastry blender) Set aside. Use a stand mixer to cream the softened butter in a large bowl; add sugar in several additions and beat until light and fluffy. Add the egg and beat well. Use a small bowl and sift together the flour, baking powder, cornstarch and salt. In a measuring cup or another small bowl, add the vanilla extract to the milk. 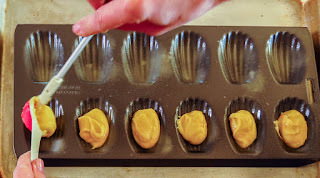 Set the mixer on low speed and add small additions of the sifted flour mixture, alternating with the vanilla/milk mixture into the butter mixture. Do this in two or three additions. 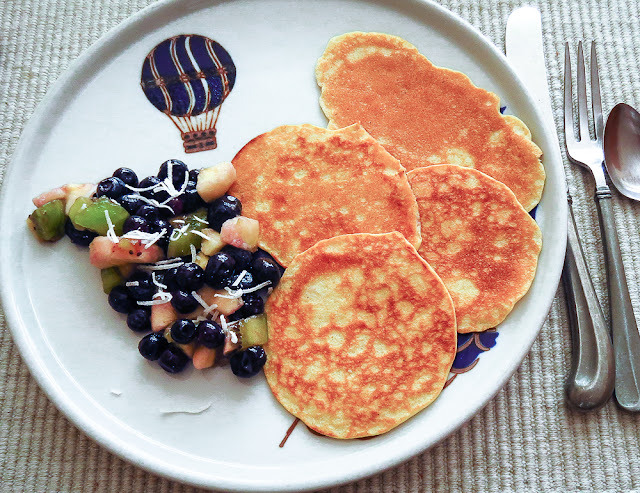 Gently stir the flour-dusted blueberries into the batter by hand. 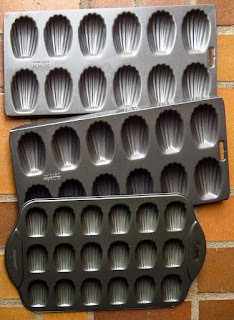 Spread the batter evenly into the prepared cake pan. Sprinkle the topping evenly over the batter. Place in preheated oven and bake for 45-50 minutes until cake tests done in the center. Let cake cool for 15 minutes, then cut and serve warm. 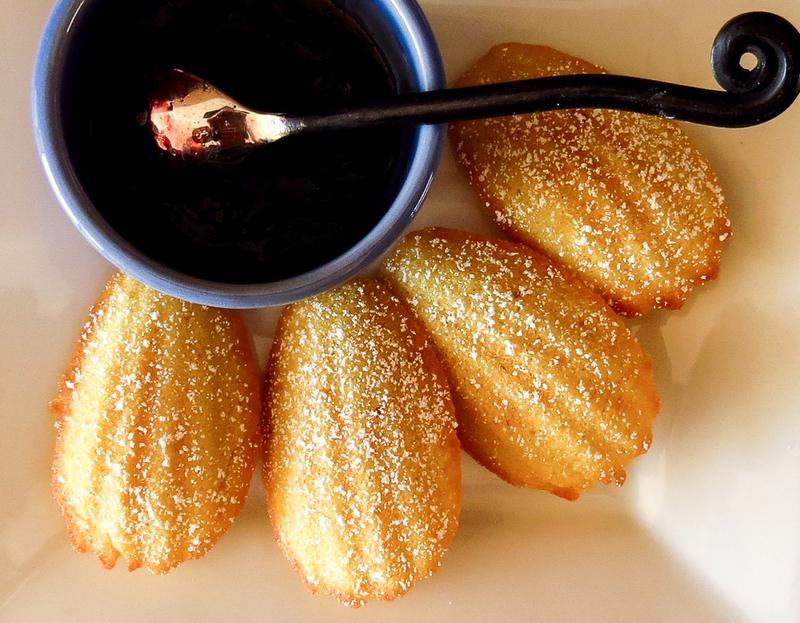 What's not to love about a madeleine? Soft and buttery, light and moist, these airy little cakes are a blissful bite of magic. Can you tell that I'm a fan? Yes, a fan, but a very recent fan. I sampled my first-ever madeleine last month, at home in my own kitchen. Some unremembered online post, or maybe a Pinterest pin or two, caught my fancy and prompted an Amazon purchase of nonstick madeleine pans. 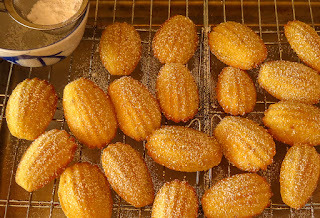 I've always thought of madeleines as fussy, intimidating cookies; difficult to master, even a bit daunting to attempt. Hey, they're French! Company in the kitchen would make the activity fun no matter what the results, so Hilary joined me for the baking adventure. We used the recipe that came on the pan's cardboard wrapper, but incorporated some tips from a Mark Bittman post. We rested the batter for an hour and chilled the pans and the batter, but ignored Bittman's caution to avoid overbeating the batter. Did it make a difference? Who knows, but our results were judged a 5-star delicious success by all taste testers. How could I have ignored these iconic French treats for so long? Sweet, but not too sweet. Crisp edges surrounded soft interiors. The citrus flavor was subtle but evident. These delicious little scallop-shaped cakes have shot to the top of my Favorite Sweets list, though we can't wait to try some other flavor combinations as well. Almond, lemon, lavender... What's your favorite madeleine? Preheat oven to 350 F. Spray the madeleine molds with baking spray. (I used Pam+flour spray.) Hold in the fridge until ready to fill. Sift together flour and baking powder in a small bowl. Set aside. In the bowl of a stand mixer, beat eggs, orange extract and orange zest on high speed for 5 minutes. Gradually beat in powdered sugar; beat another 5 minutes or until thick. Gently fold in flour mixture, then melted butter. Mix until smooth. Chill in the fridge for an hour. Spoon or pipe the mixture into the cups, filling about 3/4 full. 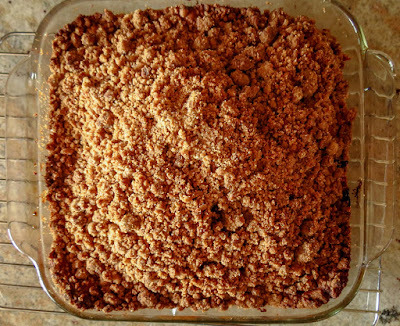 Bake approximately 8 minutes, or until edges are light brown. Be careful not to overtake. Cool in the pan around 1-2 minutes. Tap on the counter to loosen the cookies, or loosen with a knife, then invert pan on a rack. When cool, sprinkle the tops with powdered sugar. Ole! Are you looking for some Cinco de Mayo recipe suggestions? Here are some of the dishes we enjoy that are currently listed in My Recipe Index. 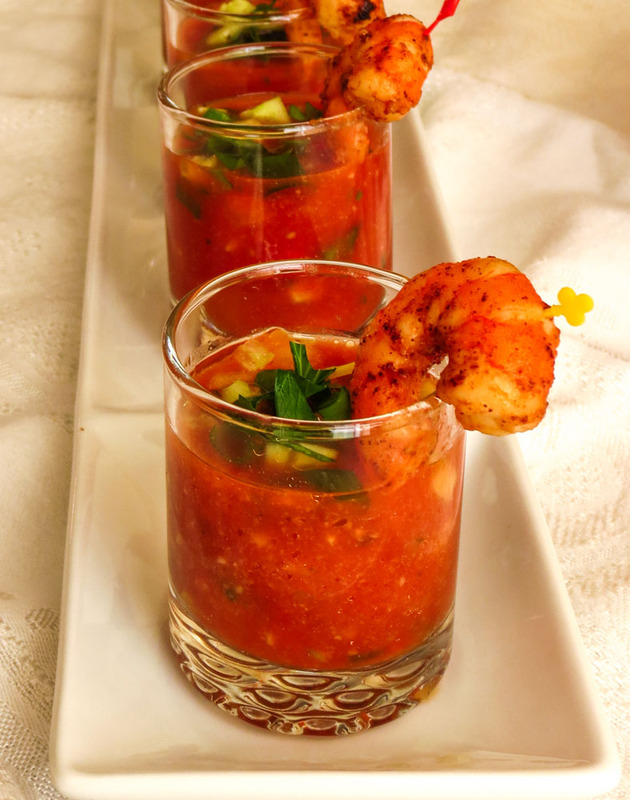 Many other Mexican (Tex-Mex, Southwestern, Border State) recipes are coming, still waiting to be repeated, photographed and posted. Check back again and see how much the collection has grown, but don't wait for Cinco de Mayo to enjoy these flavorful dishes. Gadzooks! it has been ages since I have invited you to drop by and visit. It's nothing personal, honest, but the routine kitchen activity aound here hasn't been all that engaging as the last weeks of winter dragged on. I am counting on Spring to supply some creative cooking energy - although the sunshine and blossoms visible through the sliding glass door keep interfering, luring me outside to enjoy the day. Spring in Seattle is something to behold, sunny or not. Photo: Mt. 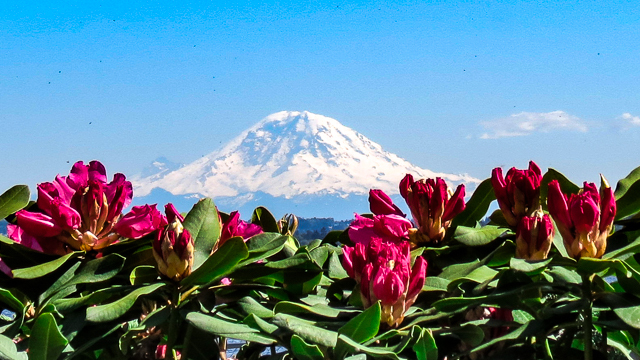 Rainier and rhododendron blooms vie for attention. ...in my kitchen, breakfast is not routine and predictable. Traditional and non-traditional items alternate on a random basis, some healthy and others not-so-much. On the current list of breakfast favorites, cold pizza slices rank right up there along with almond milk/fruit smoothies, toast and avocado slices, or a soft-cooked egg atop a mixed green salad... with fresh croutons and bacon crumbles, of course. Today RL requested Swedish pancakes. Pancakes? I really prefer sourdough waffles to Swedish pancakes, but he offered to man the griddle so I smiled and cheerfully enjoyed the treat. Along with blueberries and kiwi, this started the month off right. Happy May Day. Photo: The balloon lifting off on the "Up, Up and Away" plate fit my uplifted spirits in Seattle's MayDay sunshine and warm weather. Photo: Swedish Pancake as a wrap or breakfast taco? Any excuse for finger food, just add a dab of Greek yogurt and some fruit, or try a slather of butter and a sprinkle of cinnamon sugar. ...in my kitchen you will find more new, single-purpose items. Lack of impulse control... again. 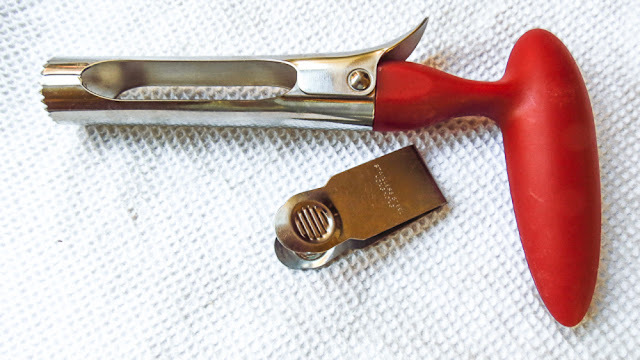 The new apple corer has proven to be easier to grip and much kinder to achey hands than a previous model, and releases the core without any fuss. 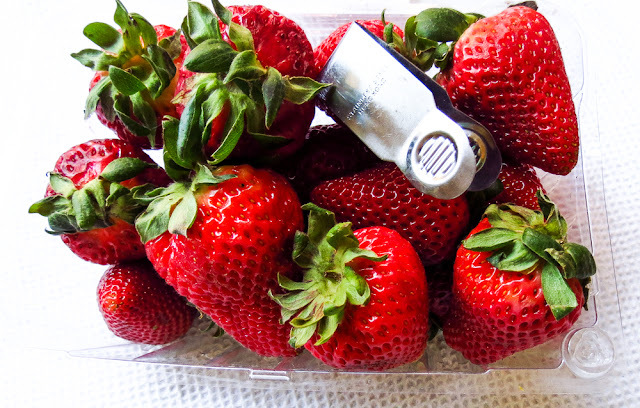 The strawberry huller was just too cute to pass up, in addition to being relatively functional and requiring little drawer space. Necessary, you ask? whatever does that have to do with gadget love?! Three new madeleine pans called for reorganizing some vertical storage space, but oh my! the sweet little cakes are such amazing bites. How could I have waited this many years for my first taste?! 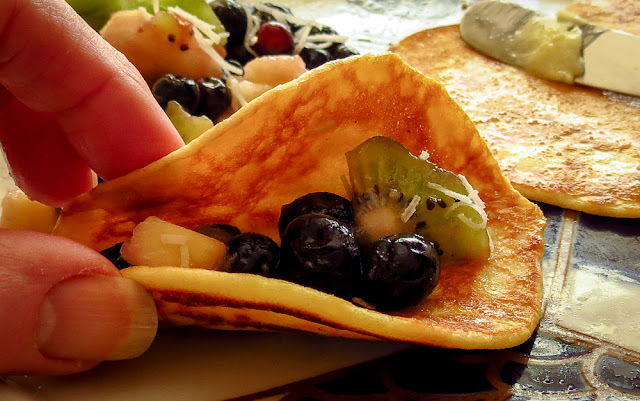 It's time to make up for lost opportunities and explore various flavor combinations. Stand by for posts to follow as the taste tests proceed. ...in my kitchen old gadgets mix with the new. Ages ago my father-in-law delivered a large cardboard box filled with "old stuff" he had accumulated, things he thought I might find interesting. Many hung on the wall as objet d'art, but eventually were boxed up, labeled and sent to long-term storage. During a recent flurry of organizing and decluttering, these treasures resurfaced again, tucked away on a closet shelf in my study. Imagine the fun of rediscovery... and the puzzle of what to do with all of this cool "old stuff". Photo props, I suppose, and I'll think of John whenever I use one of his nifty gadgets. 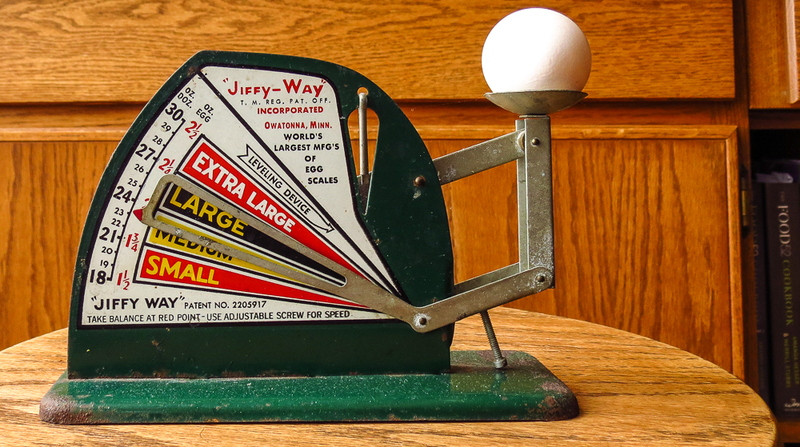 The egg scale seems workable, though the calibration needs some fidding... surely the grocery didn't make a mistake with the eggs labeled "large". How do you size eggs today when you raise chickens? 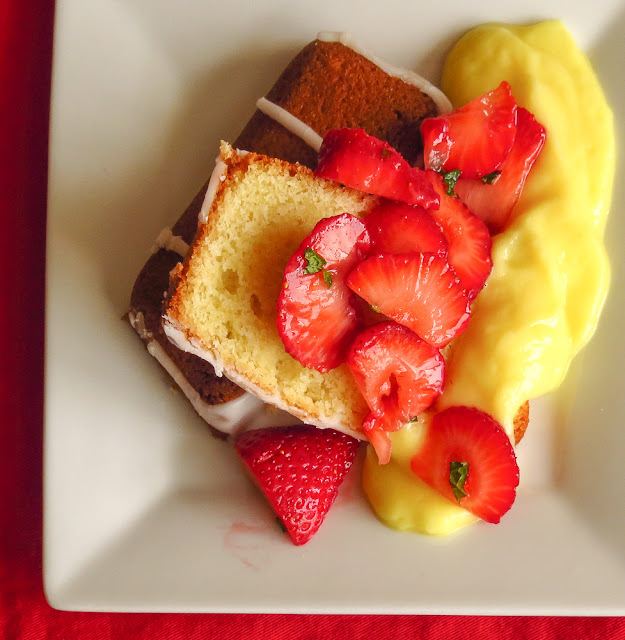 This IMK post began with sunshine and breakfast and ends with dessert, Lemon Pound Cake with Lemon Custard Sauce and fresh strawberries with mint. Guilty confession - not just dessert, we ate some for breakfast as well. Now I'm out the door to check on the latest blossoms and watch the waterfowl. Small flotillas of Canadian geese are paddling by, honking loudly while shepherding scores of newly-hatched downy little fluffballs. Wow, those chicks (okay, goslings) can move fast, paddling like wind-up toys as they race for the shelter of a dock or overhanging bush whenever eagles cruise overhead. 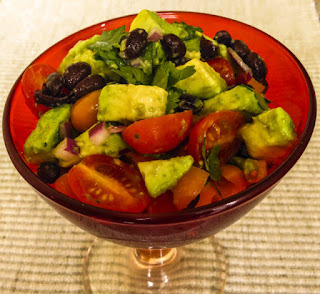 The monthly In My Kitchen roundup is hosted by Maureen at Orgasmic Chef. 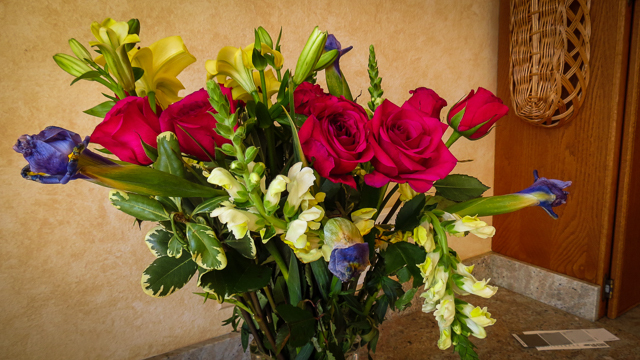 Click on the link to visit Maureen and see what is happening in other kitchens around the world. Check back often as the list of IMK participants grows daily until the 10th of each month. Happy Spring, and thanks for the visit.